Planning a trip to Pigeon Forge, but aren’t sure what’s worth spending your time doing? We’ve got the ultimate bucket list of things to do in Pigeon Forge, so you know that you’ll have a vacation to remember! Dollywood is a theme park named after the famous singer Dolly Parton. The park is decorated in East Tennessee charm and butterflies (Dolly’s favorite). Dollywood is home to many award winning roller coasters and rides like the Wild Eagle and Mystery Mine. You can find other more gentle rides here as well though, along with several shows, games, and plenty of good food. Are you into murder mystery or any crime related TV shows or movies? Then the Alcatraz East Crime Museum is your place to see. You’ll find so much more here than just exhibits about Alcatraz penitentiary. You’ll find artifacts from Jessie James era to O.J. Simpson, Ted Bundy, Al Capone, and more! There’s over 500 authentic artifacts inside the museum. The Old Mill is listed on the National Register of Historic Places, and was once a water powered gristmill that provided electricity to the surrounding city. It still has a beautiful water falling beside it that turns the mill’s wheel. You can come here to eat at the Old Mill Restaurant to feast on mouth watering, authentic Southern cooking. Or you can grab a snack at the Pottery House across the street. When you get done eating you can visit the unique shops to grab a souvenir or gift. It is one of the most of popular things to do in Pigeon Forge. If you are looking for a place to have a date night with excellent food every time, the Alamo Steakhouse is it. The restaurant has a rustic, Texas theme with Alamo themed architecture and cattle horns used as much of the decor inspiration. The Alamo is proud of the time and care they put into their food with specially cut, seared, and spiced steaks, to homemade gravies and sauces, and even made to order mozzarella sticks. Food here is always fresh and sizzling. Mama’s Farmhouse is a come hungry and leave with a happy and full stomach type of place. Food here is cooked Southern Style, and is served family style which means the portions are very large and it all comes at once that you serve yourself. You’ll find items like ham, fried chicken, mashed potatoes, and more. Seeing a Country Tonite show is one of the big favorites for things to do in Pigeon Forge. You’ll find some of the area’s best performers in this show. The Country Tonite show has dancing, singing, comedy, gospel, American Patriotism, and so much more. The music ranges from old country to new country blending it together in an entertaining way you won’t forget. The Hatfield and McCoy feud is one of the most infamous family feuds in history. The Hatfield and McCoy Dinner Show takes that tale and turns into a must-see show. It features singers, dancers, special performers, and comedy. You can spend your evening watching the two families hilariously pick at each other all while feasting on some delicious food. Their all you can eat dinner has items like fried chicken, buttery corn on the cob, grandma’s special dessert and more. 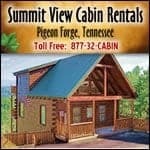 Pigeon Forge is the neighbor of the Great Smoky Mountains National Park. This is the biggest draw to the area, and the number one recommended of things to do in Pigeon Forge. You will find over 800 miles of hiking trails inside this park, and these trails will lead to beautiful rivers, historic park buildings, and picture perfect mountain scenes. Being inside the park is the perfect places to learn about Appalachian history and see native wildlife. Cades Cove is the most popular destination in the Great Smoky Mountains National Park. It is valley that offers beautiful scenes of the mountains, but also has gentle rolling pastures with old log cabins and primitive churches nestled through. You can navigate through Cades Cove along an 11 mile motor loop. This is a popular place to see historic park structures and spot wildlife like deer and bears. You can learn about other things to do and see Pigeon Forge by exploring here!